Tapalian Law has decades of Premises Liability experience representing the victims of slip and fall injuries in Rhode Island and Massachusetts. We are the aggressive, professional personal injury law firm you need to handle claims for serious personal injury as a result of a property owner’s negligence. 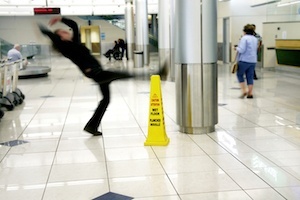 Slip and fall injuries reside under the umbrella of premises liability claims. Anyone who suffers an injury due to tripping, slipping, or falling due to an unsafe condition may be able to recover compensation for medical bills, ongoing treatment and lost wages. If the property owner could have avoided your injury by practicing a bit of care, you stand a good chance at recovering damages for your injuries. Let’s say you are walking in an established neighborhood with very old trees. In front of one house, there is a piece of buckled up sidewalk, caused by the tree’s roots growing underneath, pushing the concrete up. If you trip over that sidewalk, the property owner may be held liable for your injuries. If the injuries are serious, damages may be awarded as a result. Why Should You Hire an Injury Attorney after a Slip & Fall Accident? Of course, this is just one of many examples of a situation that can lead to a slip & fall lawsuit. Loose carpet, wet or slippery floors, icy parking lots, poorly lit stairwells, or stairs with no railing, broken stairs, or faulty equipment can all lead to a premises liability claim. Any unsafe condition that the owner of the premises could have avoided may be categorized as a premises liability lawsuit. When you are injured in a slip and fall accident with serious injury, you must have a firm with experience. When choosing an attorney, the right law firm makes a difference. You should consult an attorney who has extensive experience with slip and fall type injuries. Tapalian Law is a firm well versed in injuries that result due to a slip and fall. Premises liability claims can be complicated and very tough to prove. This is not the type of fight you want to take on alone, you need experienced, professional representation to be sure your rights are protected. Get the compensation you deserve for your slip and fall accident by putting our experience to work for you. Contact us for a free consultation about your legal rights and make an informed decision about your situation. Our law firm has extensive contacts in the medical community to assist our clients in documenting the seriousness of the injuries resulting from theand fall. Even the simplest injury claim can become complicated quickly. Rather than make a mistake that could hurt your chance at recovering compensation, put our experience to work for you. It is crucial that measures are taken immediately to preserve evidence, investigate the accident, and to submit a claim before the deadline imposed by the statute of limitations. If you or a loved one has been injured, don’t delay. Contact personal injury Attorney Tapalian today for a free legal consultation. There is never a fee or any costs unless we are successful. We will help you so that you understand your rights and obligations under the law.